You know, I never did like going to theme parks. I know most people love the hell out of them, but they're just not for me. Standing in line in the hot sun for an hour to go on a ride that takes a minute seems... well, it's not my idea of a good time. My idea of a good time is sitting down with some friends for a game. 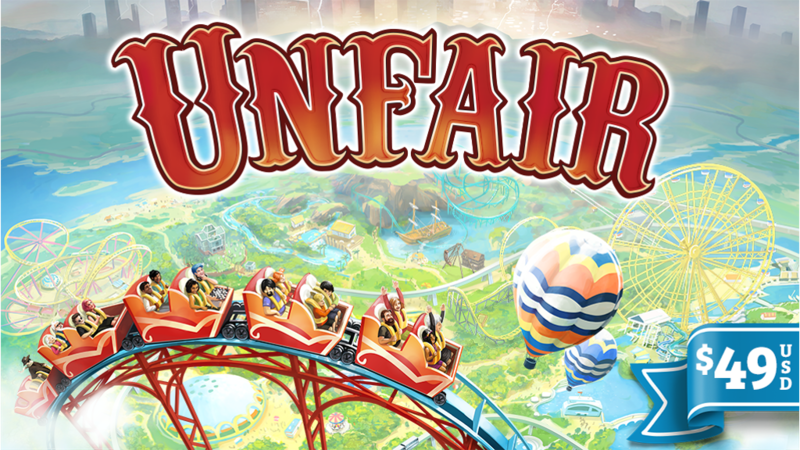 As such, the theme parks in Unfair are probably the only I'm going to directly interact with, and that's ok with me, since I get to be in charge of the park. The game's up on Kickstarter now. In the game, players take on the responsibility of created the greatest theme park around. They'll draw cards based on one of four themes: jungle, robots, vampires, and pirates. Using those cards, they'll build the tallest roller coasters, have the greatest attractions, serve the best concessions and beat out their opponents. But... what if someone else has a taller coaster or better concessions? Well, maybe you can bribe a safety official to close down that ride or send a band of hooligans to trash the concessions stand. All's fair in love and amusement park rides. The Kickstarter campaign is up and running now. They're already 3/5 of the way to their goal with still 30 days to go.